Weight maintenance: when calories eaten = calories burnt. Step 1: Calculate your Body Mass Index (BMI). You can calculate it manually by using the formula BMI = weight in kg / height in meter2 or use our BMI calculator. 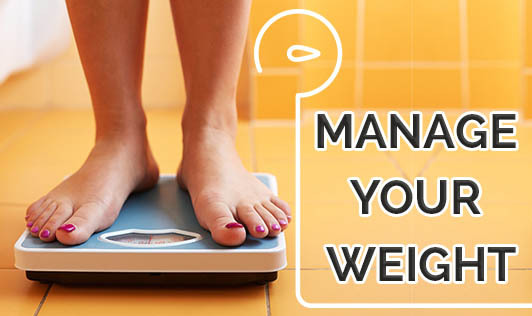 Step 2: Check if your BMI falls within the Normal range (BMI = 19-22), Underweight (BMI ≤ 18.5), Overweight (BMI = 23-25), or Obese (BMI = 26 and above). (Note: The BMI for Indians/ South Asians is different from the western population). Step 3: Get yourself (and your family) on the path to good health by following a healthy diet and by exercising regularly. A qualified dietitian will be able to help you with a personalized diet plan that will keep your needs and also the needs of your body in mind.